Click to download our EXHIBITOR REGISTRATION form. 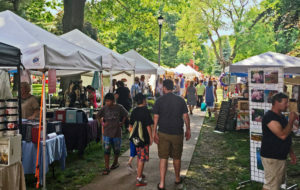 The annual Garrison Day Show and Sale, held in the beautiful green central parks of Beaver, is one of the community’s largest, most exciting and visible events each year, drawing more than 10,000 visitors annually. Garrison Day, named in honor of the military garrison stationed at Fort McIntosh in the late 1700s, involves hundreds of arts and crafts and antiques vendors, a variety of food and refreshments, an art show, music by the Fort McIntosh Fife and Drum Corps, and other lively entertainment. For information on how to obtain exhibit or food vendor space, contact event coordinator Linda McGaffic at 724-544-0477 or garrisonday@beaverheritage.org.